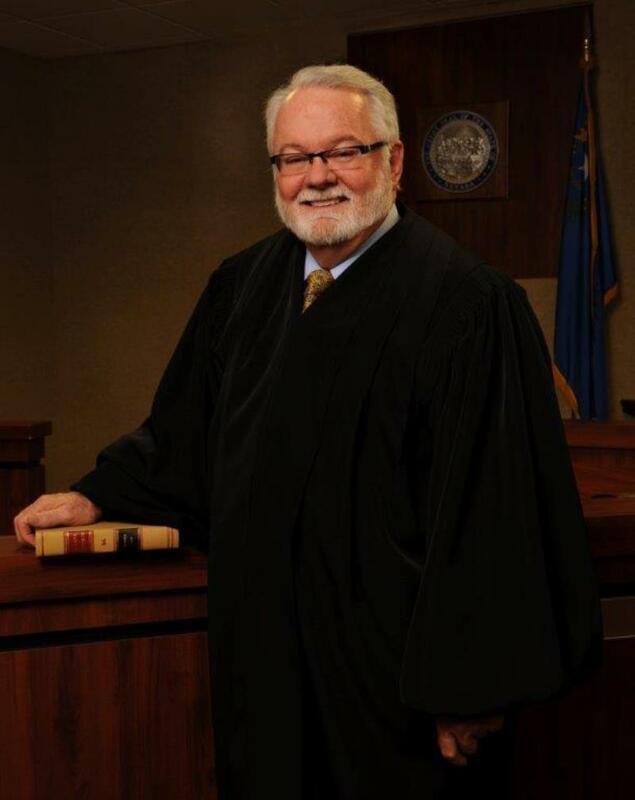 Judge Crockett has lived in Las Vegas since 1952. He attended Kindergarten through High School in the Clark County School District public education system and graduated a year early. He attended his first year of college at Nevada Southern University (now known as University of Nevada Las Vegas). He completed his college education at Loyola-Marymount University in Los Angeles, earning a Bachelor’s Degree in History and Political Science in 1971. Judge Crockett then attended the University of the Pacific’s McGeorge School of Law in Sacramento where he received the American Jurisprudence Award in Tort Law and served as President of the Student Bar Association and received the President’s Scholarship. Upon graduation from law school in 1974, Judge Crockett returned to Nevada, passed the Nevada Bar Exam and opened his own law office. In 1979, he partnered with Rich Myers and they formed the law firm of Crockett & Myers. The Crockett & Myers firm represented private citizens in civil litigation for over 35 years until Judge Crockett was elected to the bench in November of 2014. Judge Crockett has been a Board Certified Civil Trial Advocate since 1983. In 2006, he received the “Trial Lawyer of the Year” award from the Nevada Trial Lawyers Association and in 2007, he received the NTLA’s Ray Badger Award for outstanding service to the organization. Judge Crockett took his Oath of Office on January 2, 2015, and is now enjoying his first year as a Civil Trial Court Judge in Department 24 of the Eighth District Court. Judge Crockett is married and has an adult daughter. His hobbies are motorcycling and travel. Department 24 is currently assigned a Civil Court Docket. Department 24 hears Civil Court matters on Tuesdays and Thursdays at 9:00 AM. Department 24 considers matters set on the Chambers calendars on Tuesdays and Thursdays. Matters which will automatically be set on the Chambers calendar are as follows: Pro Hac Vice, Motion to Associate Counsel, Motion to Withdraw, Motion for Reconsideration, and Status Checks for Blocked Accounts. Department 24 is a Court Reporter courtroom. Accordingly, the Court Reporter's transcript, if arranged for in advance, is the only official transcript of proceedings in Department 24. You may contact Bill Nelson & Associates at 702-360-4677 or zbillnelson@aol.com to make arrangements for court reporting. Department 24 requires telephonic appearances be made via Court Call. Counsel must seek prior approval from Department 24 for the telephonic appearance and must arrange appearance via Court Call at least 24 hours prior to their scheduled hearing by contacting Court Call directly at 888-882-6878. All Petitions to Seal Records must be filed with a Notice of Hearing setting the matter for hearing on the Department 24 Law & Motion calendar. All petitions must be accompanied by a copy of the police/arrest report related to each charge included in the petition. Petitioner must also submit an affidavit in support of the petition which must contain a brief biography of Petitioner's life from the date of the arrest to the present, to include basic facts such as education, work and family history, life experiences and/or accomplishments, and arrests and/or charges not eligible for sealing, along with an explanation of why Petitioner has now chosen to petition the Court for the sealing of records. All Default Judgments for a total award of less than $100,000 may be submitted to Chambers. All Default Judgments for a total award of $100,000 or more and Default Judgments with relief sought, including non-sum certain dollar amounts, must be set on the Court’s regular motion calendar. A courtesy copy of any Application for Default Judgment which may be considered in Chambers should be delivered to Department 24 (along with the proposed Default Judgment) upon filing of the Application with the Court. Live testimony is required at the prove-up hearing, but telephonic appearances are permitted. All Petitions to compromise the claims of minors may be submitted to Chambers for processing without placing the matter on the Court’s calendar. A courtesy copy of the filed Petition (along with the proposed Order) should be delivered to Department 24 upon filing of the Petition with the Court. All motions seeking an extension of time to serve a party may be submitted to Chambers for processing without placing the matter on the Court’s calendar. A courtesy copy of the filed Motion (along with the proposed Order) should be delivered to Department 24 upon filing of the Motion with the Court. Department 24 will only grant unopposed motions in advance of the hearing date if a non-opposition is filed in the case by the opposite party. Department 24 requires proposed orders to be submitted to Chambers within ten (10) days of notification to the parties pursuant to EDCR 7.21. All orders must bear original signatures by all counsel. Counsel designated to prepare the order will be advised if the Court requires the non-drafting counsel to review the order prior to submission. Disputes may be resolved by submission to Chambers of a proposed order copied on all parties, with or without a draft of a competing order. A hearing shall only be set if counsel files a Motion for Reconsideration or Clarification, and counsel is unsatisfied with the proposed order the Court elected to sign. Department 24 uses the “Arizona Method” of jury selection, requiring voir dire to be directed toward the minimum number of jurors necessary to be qualified, rather than the entire venire.